For the past two years, I have had the great pleasure of spending two lessons a week teaching in our Early Learning Centre. My role has been to provide the pre-Prep students the opportunity to experience Design Technology in its simplest form and also to introduce the students to problem solving using Design Thinking. I am High School trained but have been working for a number of years with primary students. Pre-Prep, has been a completely new and exciting experience for me. One of things I love about Design Thinking is that it can be as complex or as simple as you like. It can be used over a lesson, a term or even a semester, And there is no age limit as these 4-year-old students demonstrated. Our Early Learning Centre is underpinned by the Reggio Emilia philosophy of learning wherein the students’ interests drive the curriculum. 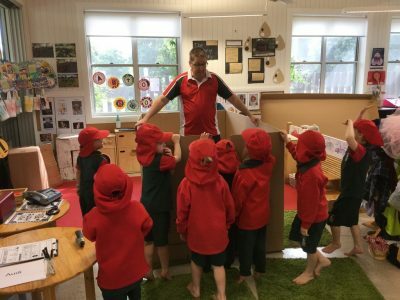 In one particular classroom, cars are a great point of discussion so their teacher, Mrs H, challenged them with a provocation, “How do we look after our cars?” In that first week, students built cars from cardboard boxes. They added features like headlights, steering wheels and switches. They designed and built a petrol pump and built a car wash which was very popular for washing cars, but very cramped. In the second week, the cars needed repairs and the students’ interests shifted to what happens in an Auto shop. Repairs, mechanics, maintenance checklists and tools needed to fix cars were all created and enacted. In discussion with Mrs H, she mentioned to me that she had shown the students the car wash clip from the Pixar movie Sharks Tale and said the kids loved the song and had asked if they could wash a car. With this in mind, along with the fact that we had just been gifted a very large box, I decided to challenge the kids to design and make a life size, working car wash. These students are only 4 years old and can’t read, but I wanted to use the language we use in Design Thinking. I wanted to use words like Design, Create, Ideate, Prototype, and Investigate. With that in mind, we started with our Engage phase of our Model. The initial discussion was prompted by thoughts about who would use a car wash and how big it had to be to suit different vehicles. 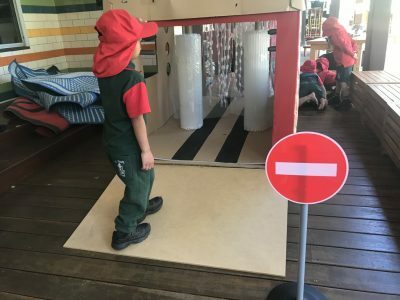 We did a little drama play of taking our school bus through a car wash. We thought about what happened in a car wash and the different stages of cleaning. Then we watched videos and learnt about car washes. Finally, to make our thinking clear, we drew a flow chart representing the different stages of the car wash including, wetting the car, adding soap, scrubbing and drying the car. When it came to Ideating, four of the Pre-Prep Team, with some older students accompanying them, visited the school’s Possibility Hub. Our Possibility Hub contains tons of industrial waste materials for just this sort of project. Students explored lots of different materials to suit the various stages on the flow chart. For some, there were lots of options and so a collaborative discussion on what to use and how to use it was conducted. We returned to class to show our friends the materials we were thinking about and to explain how we were going to use them. There was also time for our friends to give us feedback and they had lots of ideas. When it came to Prototyping, the excitement went to another level. Everybody wanted to help which was very difficult to manage, so shifts of workers were set up. We made rollers for our car wash. We also made water jets, soap curtains and water sprays as well as drying jets. A pay machine was added to the front and a secret curtain to drive through at the start. It was starting to look amazing but we soon discovered that unless you were inside the car wash, you couldn’t see what was happening. We decided that even though car washes didn’t have windows, we wanted ours to have windows so everyone could see inside. Last week we unveiled our finished car wash to the rest of our class. We invited special guests and showed them our video story of how we designed and created this car wash. We presented to our guests the materials we chose to use and the thinking behind the choice of the materials and the design of the car wash. I was immensely proud of these kids and what they had achieved. However, even prouder were the kids themselves. They had such excited and proud faces. The video showed them designing and building the car wash. They spoke with confidence and pride when describing the process. And most importantly, when I stood back and watched them play in the car wash, I saw them explaining to their friends how things worked and what to look at. This play had a whole new level of learning attached to it. Design Thinking is a powerful process of problem identifying and solving. It is a process that large organisations and successful companies use to be innovative and stay ahead of their competitors. mindsets like persistence, give it a go and learning from mistakes when it doesn’t work. These are skills/mindsets that will be essential for students to become the innovative designers and problem solvers of the future. I am very lucky because I watch the creation of these thinkers every day in the classroom.